My birthday was last weekend. For the occasion, I had hoped to bake the pumpkin butterscotch cake made so beautifully by Peabody back in August. I had all the ingredients at hand, but alas, no time. We spent the whole weekend at a lovely beach house in Lincoln City, with my brother-in-law and his family. There was absolutely no cooking, just visits to the Newport Aquarium, baseball playoffs on television, several walks on the beach, and lots of energetic playing with 4 kids, 2 ferrets, and a very happy Shepherd puppy. When we came back home, we stopped by Konditorei for a few slices of creamy cheesecake (chocolate hazelnut for me, pumpkin for Jeremy). That totally made up for the lack of birthday pastries, but I still had to use up my buttermilk. 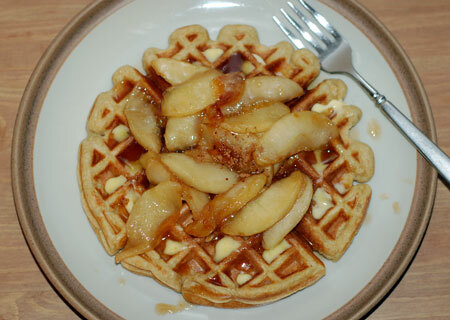 We decided on an easy breakfast-for-dinner meal last night, and I made a batch of buttermilk waffles with warm sauteed apples. These waffles, from Cooks Illustrated, came out incredibly fluffy, so much that they threatened to pop my waffle maker open during cooking. My only quibble was the addition of the melted butter to the buttermilk. My buttermilk was straight from the fridge, and the warm butter instantly solidified into clumps when I tried to mix the two together. Either bring your buttermilk to room temp and cool the melted butter, or if you’re lazy like me, just add the butter to the batter after combining the wet and dry ingredients, but before folding in the egg whites. The batter is thick, and seemed to benefit from tempering with a small spoonful of whipped egg white before attempting to fold in the rest. We got two full-sized waffles and a dinky one from this recipe, so you may want to double it. I’ve noted my slight adjustments in the recipe below. Heat waffle iron. Whisk dry ingredients together in a medium bowl. Whisk yolk with buttermilk in a measuring cup. In a small bowl, beat egg white until it holds a stiff peak. Add liquid ingredients to dry ingredients while gently mixing with a rubber spatula; mix in melted butter last. Toward end of mixing, use a folding motion to incorporate ingredients; temper batter with a spoonful of egg white, then very gently fold remaining egg white into batter. Spread appropriate amount of batter onto waffle iron. Following manufacturer’s instructions, cook waffle until golden brown, 2 to 5 minutes. Serve immediately. Serve hot on a warm plate, topped with maple cinnamon apples. Makes 2-3 waffles.